The Supreme Court ordered registration of a PIL and urged Chief Justice H L Dattu to set up a Special Bench to consider gender discrimination suffered by Muslim women owing to “arbitrary divorce and second marriage of their husbands during the currency of their first marriage”. Supreme Court on Monday, issued notices to Himachal Pradesh Chief Minister and Congress leader Virbhadra Singh on a petition filed by the CBIchallenging the state High Court’s order granting protection against their arrest in a disproportionate assets case pertaining to amassing Rs six crore worth of unaccounted money when he was a union minister. A two Judge Bench of the Supreme Court on Tuesday held thatthe statement of Accused about the complicity of a Co-accused which was unknown to the Police is admissible under Section 27 of Indian Evidence Act if it is confirmed by subsequent events. 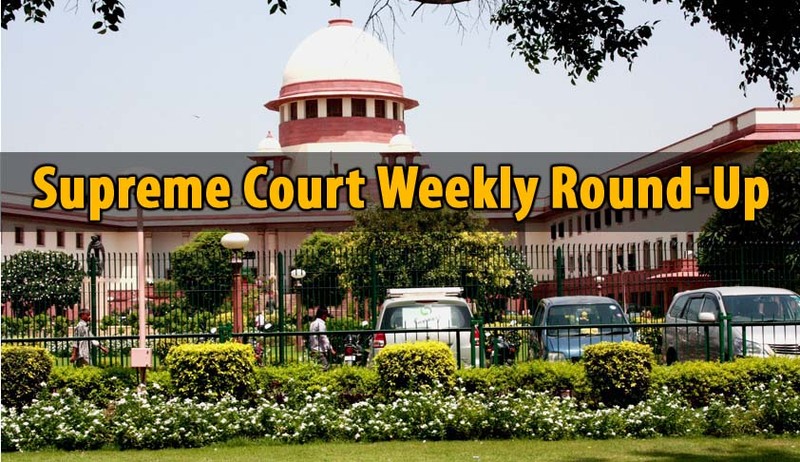 The Bench comprising of Chief Justice Dattu and Justice Arun Mishra was hearing an Appeal [Mehboob Ali &Anr. Vs.State of Rajasthan Crl.A. No. 808 of 2010] against concurrent finding of guilt under offences U/S 489C read with S.120B IPC. Acting on a PIL filed by four infants seeking checks on air and sound pollution, the Supreme Court on Wednesday prohibited bursting of sound emitting crackers between 10 pm and 6 am during any festival including Diwali but rejected their plea for a total ban on crackers. Do away with reservation of seats in medical super-speciality courses. The Supreme Court Division Bench comprising of Justices Deepak Mishra and Prafulla C. Pant dismissed a batch of petitionsfiled by some MBBS doctors complaining about eligibility criteria for admissions to certain courses – D.M. (Doctor of Medicine) and M.Ch. (Master of Chirurgiae) and expressed its opinion that the Government of India and the State Governments shall seriously consider of doing away with reservation of seats in medical super-speciality courses. Law on equal right for daughters over property is prospective. The Supreme Court held that the law on equal right for daughters over property is prospective. A Bench comprising Justice Anil R Dave and Justice A.K. Goel, in its October 16, 2015, interpreted the succession law while setting aside the Judgment of the Karnataka High Court in the case Prakash v Phulavati of 2010. The supreme court on Wednesday, in the case of Union of India &Ors. v Manoj Deswal&Ors., heldthat the personnel who go on unauthorized leave can never be good soldiers and there is nothing wrong in discharging such persons from force withoutissuing show cause notice. A two Judge Bench of Supreme Court comprising of Justices Lokur and Bodbe, on Thursday, reserved its orderon the pleas filed by Law Minister SadanandaGowda and a BJP MLA Jeevaraj against the Karnataka High Court verdict quashing the sanction of a five-storey building in Bangalore built in violation of rules. Activist Lawyer PrashantBhushan appeared for Ms.NagalakshmiBai (who had filed the PIL in the High Court). Sardar Jokes taken seriously ? The Supreme Court of India on Friday agreed to hear a public interest litigationwhich sought a ban on websites which spread jokes portraying the ‘sardar’ community as “persons of low intellect, stupid and foolish”. A bench headed by Chief Justice of India H L Dattu directed the government to enable e-votingby NRIs within three months after making necessary amendments to Representation of Peoples Act 1951 which deals with elections in the country. The Supreme Court ruled, in favour of the Assesseeand against an order dated 23rd December, 2010 passed by the Division Bench of the High Court of Karnataka at Bangalore, that Intellectual Property such as brand name, copyright and know-how are of capital nature and it can claim deduction or depreciation in Income Tax. A two Judge Bench of Supreme Court held that in no circumstances the High Court can reverse the judgment of the trial court and the first appellate court without formulating the substantial question of law and complying with the mandatory requirements of Section 100 CPC.